Custom Printed Kids Dark Wood Grain Iconic Sunglasses are made available in Dark Wood color choices and are offering a cool imprint space of 1 1/2" x 1/4". These custom kids’ sunglasses are made of plastic and are featuring UV400 lenses with 100% UVA & UVB protection. Best for the promotions of travel companies, outdoor events and schools, these custom new arrival sunglasses are CPSIA compliant too. Order these promotional products right now to earn free online proofs, free design and best price guarantee offers. 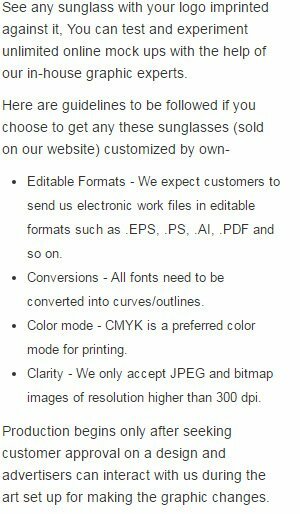 Request a quote to know price cuts that you can avail for wholesale Custom Printed Kids Dark Wood Grain Iconic Sunglasses. Product Size: Child; Frame Width: 5"; Arm Length: 5"
Additional Information: UV400 lenses provide 100% UVA & UVB protection.